When a person sees a lawn dotted with dandelions, one of two thoughts likely comes to mind: the gardener is lazy or the property owner is an environmentalist. For Gordon Hicks, it’s definitely the latter. In fact, lawns with weeds walloped by pesticides are a peeve. It’s just a small example of why Hicks, who leads Toronto-based real estate management services company Brookfield Global Integrated Solutions, is the winner of Corporate Knights’ Greenest Chief Executive in Canada Award for 2015. It all started back in 2000, when Hicks was driving his kids to their elementary school in a municipality he’d prefer not to name, north of Toronto. 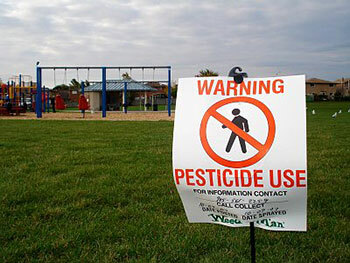 As he pulled up to the school, Hicks noticed signs posted on the playground warning where pesticides had recently been sprayed. “It dawned on me that this was so ridiculous. In areas that were known for where children would be playing, we were spraying these potential hazardous chemicals that could cause DNA damage. That infuriated me,” Hicks, 50, recalls in an interview. In response, he and a handful of other parents approached local politicians and policymakers with their concerns. Nine months later, the municipality banned the use of pesticides across public spaces where kids play. The experience emboldened Hicks to keep up the fight against environmental hazards, using the company where he has worked since 1997 (until recently named Brookfield Johnson Controls) as a template for how organizations can and should be more sustainable. Hicks, along with his team at Brookfield Global Integrated Solutions (BGIS), has been on a mission to lower its environmental footprint across the roughly 11,000 buildings, or more than 150 million square feet, it manages across Canada. That includes everything from office towers and courthouses to telecom data centres. Commercial real estate is responsible for nearly 15 per cent of greenhouse gas emissions in Canada. 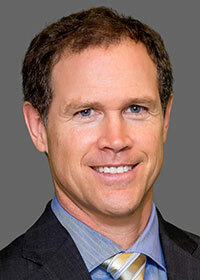 Hicks sees it as his job to drive environmental stewardship across the sector and set an example for others. Three months after taking the top job in 2006, Hicks introduced a policy to ban the use of pesticides for cosmetic lawn care across its entire client portfolio, among the first in the industry to make the move. Over the past nine years, through a wide variety of energy conservation and zero-waste programs, Hicks’ company has helped prevent millions of tonnes of GHG emissions from spewing into the atmosphere, conserved millions of litres of water, and kept thousands of tonnes of waste from ending up in landfill. What’s also inspiring for Hicks – not to mention other companies he has influenced – is the millions of dollars in operating cost savings that result from such actions. It debunks the myth that business and society have to choose between the economy and the environment, Hicks says. “We are constantly looking at ways to support our clients in reducing their energy consumption, reducing their carbon footprint and ultimately helping them to reduce their operating costs,” he says. Geoff de Bruijn, vice-president of corporate services and sustainability at Vancouver-based Telus, says his company has seen “significant savings” as a result of some of the energy and waste reduction programs inspired by Hicks through BGIS. For example, BGIS is working with Telus on a waste-diversion pilot program in B.C.’s Lower Mainland, and has offered its expertise to help the telecom company reduce the use of herbicides at some of its remote sites in the province. Hicks is a hands-on leader who often gets personally involved in the programs his company puts in place, de Bruijn says. 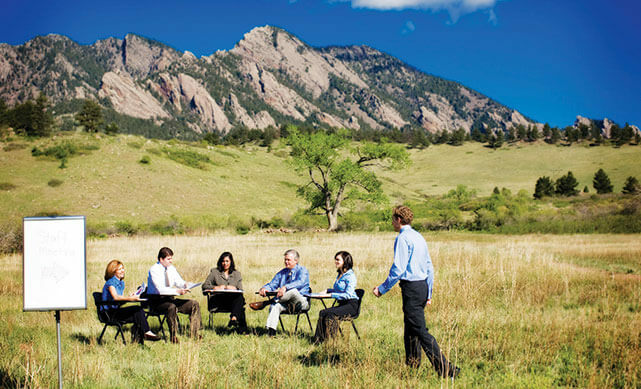 Both on and off the clock, Hicks is also inspiring organizations to think about the environment as part of their overall business operations. Shortly after Al Gore released An Inconvenient Truth in 2006, Hicks applied and became a Certified Canadian Presenter with The Climate Reality Project, founded by the former U.S. vice-president and environmental activist. His volunteer role has been to advocate and educate others about climate change. Hicks has also lured high-profile environmental speakers such as Paul Hawken, author of The Ecology of Commerce, and Jeremy Rifkin, author of The Third Industrial Revolution, to talk at a speakers series his company hosts in Toronto called Inspired Future. “We wanted to educate people on the fact that you can have a successful economy while being cognizant of what you’re doing with the environment – that the two could co-exist and in fact most businesses that were focused on waste reduction and efficiency … were outperforming,” Hicks says. Hicks is actively involved in a handful of climate-focused organizations, such as the Council for Clean Capitalism, a group of companies that encourages governments to become more sustainable through long-term economic planning. He also worked alongside other environmentalists and business leaders to lobby the Ontario government to put a price on carbon emissions. “Our hope is that some of what we’re sharing is resonating and being adopted,” Hicks says. He’s also working with the World Wildlife Fund (WWF) on its annual Spring Things workplace campaign to help conserve the environment, animals and natural habitat. WWF-Canada president David Miller describes Hicks as a “highly principled” person and leader – someone who acts on his values. “It’s exactly the kind of business leadership that we need, and that’s clearly possible,” says Miller, the former mayor of Toronto. While Hicks may have a long-term view, he’s impatient on what he sees is a slow adoption of sustainability measures and general awareness of how society is harming the environment. “I think everyone gets it, and appreciates the need for some change. What’s challenging is being able to get people to take action and to take a stand on something,” says Hicks, urging stronger leadership. 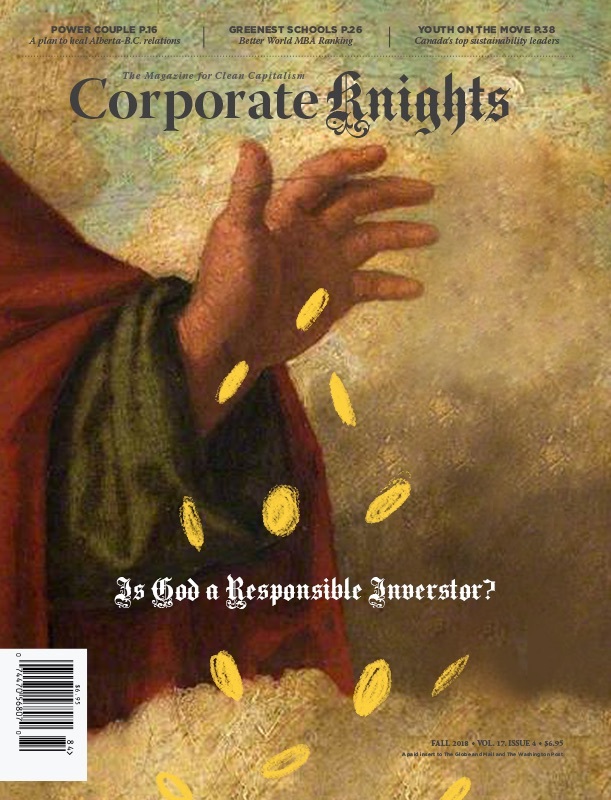 Corporate Knights launched its inaugural, bi-annual Greenest Chief Executive Award in 2013 to recognize the CEO of a major Canadian corporation who is doing the best job of earning profits while preserving the planet. In our search for this individual, we look for evidence of a genuine commitment to environmental responsibility and overall improved sustainability performance, as well as an understanding of the risks of not treating sustainability as more than an exercise in public relations. The winner of 2013’s award was Alain Lemaire, who at the time was CEO of Cascades. Corporate Knights accepted nominations for the 2015 award in February and March. A nominated CEO’s company was required to have a minimum of $500 million in annual revenue. Once all nominations were received, a short list of five finalists was determined based on how nominees performed against four key criteria: greenness of operations; greenness of CEO’s pay; green impact beyond the company; and greenness of company products/services. A panel of respected leaders from the environmental community selected a winner from the short list. The award was presented at the Corporate Knights Best 50 Gala in June.